From its start as a dream in Mattel’s eye, this is the story of Hot Wheels written by one of the first designers. Realizing that model cars would be more fun if you could race them, Mattel had a hit with its innovative Hot Wheels cars and tracks. The cars were designed by real gearheads who were basing their models on popular souped-up cars from 1960s car mags. The designers were pulled from Detroit’s car makers by letting them design an entire, though 1/64th scale, car rather than only a small piece of a real car. 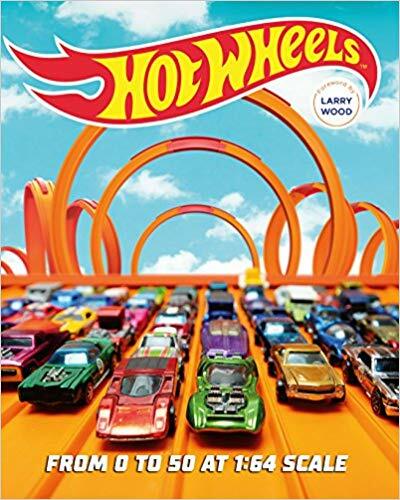 I loved Hot Wheels as a kid and snatched this book quickly off of NetGalley. The pictures of vintage Hot Wheels certainly brought back memories of my own cars. While the pictures are awesome, the story of how something completely different was created from the ground up is the star. This is a tale of how business innovation works. Have a great idea. Ignore the naysayers. Hire a great staff. Don’t rest on your laurels but keep reinvigorating your product line. A great choice for the Hot Wheels fan. It also would be fantastic for that entrepreneur wannabe in your life. 4 stars! Thanks to the publisher, Motorbooks, and NetGalley for an advanced copy.